We’re HERE! After an uneventful drive through the Nevada desert we hit Vegas in the daytime. Not quite as exciting as the nighttime skyline, but who cares! 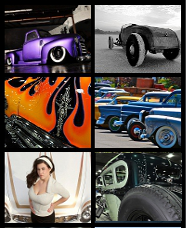 We’re here for the hot rods, customs and pinups that make Viva Las Vegas a must every year. Sunset’s a great time to catch photos, even for a hack like me, but my man Swanee’s doing his thing for this picture. Several beers later and with a dead cell phone and wireless that doesn’t work, we’re still getting these pictures and tons more up in the next few days. One of the best parts of the Viva Las Vegas is the pinups. The show’s a gathering of all things hot rods, music and vintage clothes wearing girls with bright red lipstick, a flower in their hair and some great expressions on their faces! I’ll try to catch this lovely lady’s name at the show today. Update… didn’t see her again on Saturday. Anyone know her name? Please leave a comment below. The car, if you can see it, is a 1949 Buick Super owned by Sonny Vasquez out of Ventura, CA. In case you’re wondering where all the other girls are, here’s 2009’s Ladies of Viva and 2009 Pinup picture gallery. 2010’s on it way in the next couple days and we added April’s Pinup of the Month – Notorious Ang – From VLV#13. Always in the scene is Bo Huff. This 1957 Ford Ranchero looked perfect. Slammed down, tastefully done flames on the side and some really trick custom work on headlights. More pictures coming. Fellow Arizona resident, Mike’s out of Lake Havasu,AZ and is a member of MyRideisMe.com under the name Moparsixer. Guess what he’s running in his 1938 Chrysler? Check out some more info about his cool hot rod here in his garage at MyRideisMe.com. That suede gold paint works perfectly, don’t you think? I gotta get back to the show today, so check out a few other shots and look for more soon!! For a look at what Viva Las Vegas is, check out the intro blog from my first time at the show last year. Were you there? Let us know! Leave a comment if we shot your car and include a few details. Thank you. Why not leave a comment? This isn’t a print magazine where you take what you’re given every time with your only chance for feedback happening in a “letter to the editor” published 4 months later! This is NOW! This is interactive. Let us know, good or bad, how’d we do? Good looking out, glad to see theres still information being published and its current!! Keep it up! Hi! That’s me up there making the funny face grabbing the steering wheel! I’m Christi Invicta……that sure is an interesting pic you chose! I remember doing those shots, they were fun. I think we did a few around the car too. I’d love to see more, if you have them! You took great pics! The cars are awesome! Pics look magazine quality to me. Bo Huff’s 57 ranchero (Panochero) is my favorite build ever. One day at the shop I was cleaning up ready to go home, and Bo pulled up asking if I had a minute and I replied; Only if it’s a quick one and the idea for this amazing ride became reality. His idea was to mirror the bed rails with 1″ rolled rod.? Ok I said then in half an hour me and Big E had them bent to match the chrome that matches them. Next day he took all day to come in I had suspicions about his health then. But I had done something to make him really happy and the car reached legendary status. Welded in place and more pieces cut and set for the car like the rear bumper molding and all the metal pieces closing in the extensions bent 1/4 in rod to emphasize all rounded edges. With Edsel bumper sealed in the rear and von dutch eyebrows tacked on I went to jail and never seen it until well after the body work was done and it was ready for paint.